When the Museum of Natural and Cultural History unveils its next exhibit, visitors will get a rare glimpse into its vast collections and hear the fascinating stories that faculty and student researchers have to tell about them. 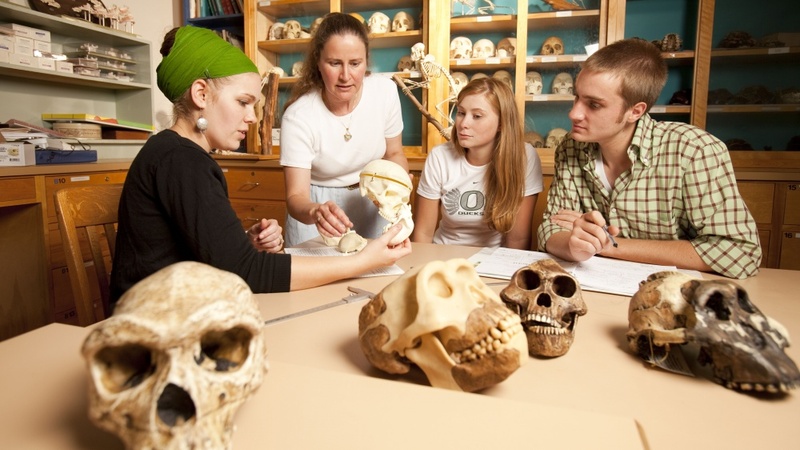 From monkey skulls to fossil soils to cultural objects from around the globe, Navigating Knowledge: A Journey through Museum Collections highlights the diversity of the museum’s collections and the ways UO scholars use them to help unravel mysteries about the world. Museum members and UO faculty, staff and students are invited to a special exhibit preview Friday, March 2, from 5 to 7 p.m. at the museum. The exhibit opens to the public the weekend of March 3-4 from 11 a.m. to 5 p.m. Family-friendly scavenger hunts and other activities are on the menu from 11 a.m. to 2 p.m. both days of the opening weekend. The exhibit was jointly curated by 11 researchers from the College of Arts and Sciences, School of Music and Dance and College of Education. In a display area showcasing West African drums and performance apparel, ethnomusicologist Habib Iddrisu, an assistant professor in the School of Music and Dance, weighs in on their traditional and contemporary meanings, while anthropologists Stephen Dueppen and Daphne Gallagher describe the objects’ archaeological lineage. Archaeology is also in focus at a display curated by Erlandson, an archaeologist and expert in coastal dispersals and the peopling of the Americas, and museum associate director Scott Fitzpatrick, who studies human colonization of the Pacific Islands. Here, visitors can examine items from early seafarers’ toolkits, including ancient fishing gear and woodworking tools, and explore questions about how and when people first began to navigate the vast Pacific Ocean. Visitors can also journey into the museum’s Grand Primate collection with anthropologist Frances White, who is using the material to study and teach about relationships between bones and behavior among modern monkeys. Another section, co-curated by anthropologist Don Dumond and historians Stephanie Wood and Josh Fitzgerald, examines themes of conquest and cultural resilience through pictorial maps created by indigenous Mexican communities during the late 1600s. The exhibit will also bring fossils out of the vaults, like the rhino and gazelle specimens that earth sciences doctoral student Win McLaughlin studies to predict the locations of future earthquakes and the ancient soils that paleontologist Greg Retallack is investigating to help answer questions about the origin of life. Exhibitions director Ann Craig said the subject matter is broad by design. “The exhibit tells a big-picture story of how UO scholars are expanding our understanding of human cultures, natural history and geology through collections research,” she said. Despite the broad scope, the items on display represent a tiny fraction of the objects preserved in the museum’s vaults. Since its founding in the 1930s, the museum has been Oregon’s official repository for archaeological and ethnographic collections, and today its anthropological vaults contain more than 300,000 objects spanning hundreds of thousands of years of human history. The museum’s Condon fossil collection includes more than 60,000 specimens representing nearly 6,000 species, making it the state’s most comprehensive paleontological research collection. A law that went into effect in January made the Condon collection Oregon’s official home for fossil specimens found on state lands, ensuring that Oregon’s fossil heritage will remain in Oregon for generations of future scholars. The museum also curates extensive collections of rocks, modern biological specimens and zooarchaeology collections comprised of animal remains recovered from archaeological sites. The collections grow each year thanks to a combination of gifts, transfers from other facilities and ongoing fieldwork by museum scientists.